"Music is my life!" Paramount has debuted a new trailer and a new featurette for the upcoming Meryl Streep movie Florence Foster Jenkins, starring Streep as the legendary Florence Foster Jenkins, a New York heiress who dreamed of being a singer despite having a terrible voice (her story is similar to the one told in the film Marguerite). We've featured at least one teaser trailer for this previously and now we get a look at the full trailer with more footage of her horrifying crowds at Carnegie Hall. Hugh Grant also stars, and the cast includes Rebecca Ferguson, John Kavanagh, Simon Helberg, and plenty others. I'm not sure how popular this will be with younger people, but it does look amusing. And Meryl Streep is always fun. Florence Foster Jenkins is the true story of the legendary New York heiress and socialite who obsessively pursued her dream of becoming a great opera singer. The voice she heard in her head was beautiful, but to everyone else it was hilariously awful. Her "husband" and manager, St Clair Bayfield, an aristocratic English actor, was determined to protect his beloved Florence from the truth. But when Florence decided to give a public concert at Carnegie Hall in 1944, St Clair knew he faced his greatest challenge. The film is directed by Stephen Frears from a screenplay by Nicholas Martin. The cast includes Simon Helberg, Rebecca Ferguson and Nina Arianda. Being produced by Michael Kuhn for Qwerty Films and by Tracey Seaward. The film opens in the UK this May. 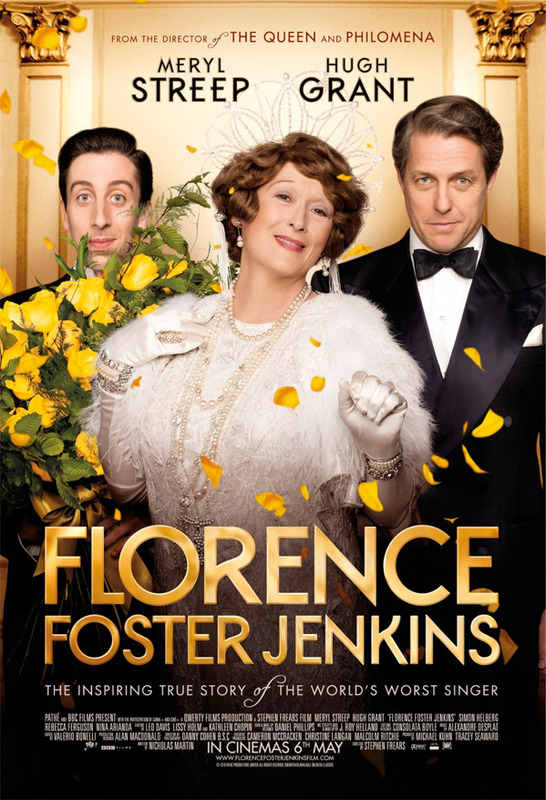 Paramount will release Florence Foster Jenkins in the US starting August 12th. You mean Meryl Streep is Meryl Streep. Good for her giving another actress a shot at Best Actress.